Ever since I saw the young lady on "Shark Tank" (love that show!) tout her facial sugar scrubs, I have been wanting to give them a try. She claimed that a sugar scrub is actually very good for sensitive skin. I thought that was really interesting seeing as I have very sensitive skin and rosacea, and I have been told to stay away from scrubs as they will only irritate my skin further. 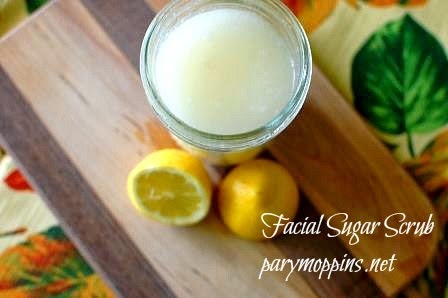 So I read up on various ingredients, took the plunge, and made one...and now my cheeks feel super soft and I'm a happy girl. Brew chamomile tea leaving tea bag in the tea until it cools. Once the tea is cool, put all of the ingredients in a jar and stir well. The consistency should be somewhat like paste. 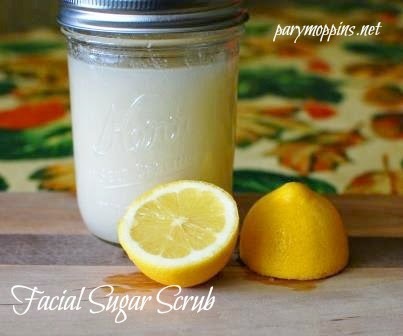 To use, put a spoonful of the mixture in your hands and using a circular motion, gently massage the sugar scrub over your face, lips, and neck. Leftover scrub can be kept in a cool dark place. This is part of Full Plate Thursday and SITS. Oooh, I have all these items, I'm getting to work!! I hope you enjoy it Ms. Kelly! It is lovely on your face, lips, and neck. No need for moisturizer afterwards either.